The calendar display one month calendar that allows the user to select dates and move to the next or previous month. By default, the first day of week is set to sunday. It can be changed by setting the value of 'firstDay' property. weekNumberHeader string The label to display on the week number header. Available since version 1.5.
getWeekNumber function(date) The function to return the week number. Available since version 1.5.
year number The year of calendar. The example below shows how to create a calendar using the specified year and month. formatter function(date) The day formatter function, return the day value. Available since version 1.3.6.
styler function(date) The styler function for calendar days, return the inline style or CSS class. Available since version 1.3.6.
validator function(date) The validator function that is used to determine if a calendar day can be selected, return false to prevent from selecting a day. Available since version 1.3.6.
onChange newDate, oldDate Fires when change a date. 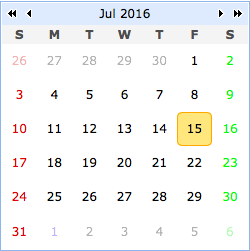 Available since version 1.3.6.
resize none Resize the calendar size. moveTo date Move the calendar to specified date.